I whipped this little tank/camisole/vest (which would you call it?) up after the NYC Yarn Crawl in the Fall with some lovely tosh dk (it was labelled tosh worsted when I bought it but they've changed it now that they've added a heavy worsted to the line; it's a light worsted weight yarn) from Downtown Yarns. I started to write up the pattern, then the Craft Fair and holidays were upon us, and benign neglect set in. Plus I was a little daunted by the notion of grading the pattern but didn't just want to offer it in one size. Now it's graded, and I'd love some test knitters to see if I did it right. So, please send me an email (kathleendames at gmail dot com) if you'd like to volunteer to test knit Vines. I've knit up the medium, which took 270 yards (exactitude - I love my little kitchen scales!) and have graded the pattern from XS to XL - I'm looking to see if I've done this grading thing correctly and to verify my yarn amount guesses. 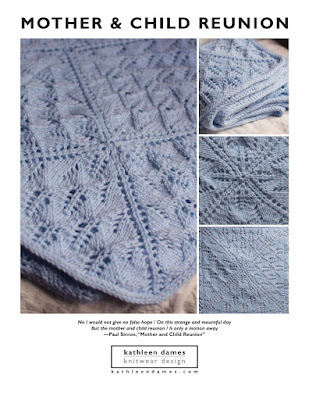 The pattern is both written out and charted, the lace is simple to work and remember but lovely nonetheless, and it only took me five days to knit (of which at least a day was spent pondering how I wanted the top edge and straps to work out). Check out my project on Ravelry for more details. Thanks to the test knitters!